Providing the highest levels of aftercare - guaranteed! 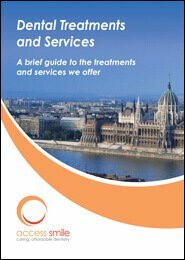 The level of aftercare support is unsurpassed and beyond that of any other dentist practice we know in Hungary or Ireland. Your treatment has a lifetime guarantee specific to the work you have had carried out and this will be made clear within our comprehensive, 'plain English' quotation. Because of the superior materials we use, your 'treatment lifetime' is often in excess of other dental practices providing the same solution. Occasionally, teeth suffer preparation trauma during crown and bridgework treatment resulting in a need for a root canal treatment afterwards. Most dental clinics would not accept liability for any unforeseen root canal treatment after having a tooth or teeth prepared for crown or bridgework. Treatment of this condition may require additional work which could be in excess of the fee for the original procedure. This means you would get charged for any work relating to this condition by other dentists but not Access Smile. Access Smile are the only dentists to include an additional 6 weeks cover for root canal treatment. This is a condition any patient of dental work could experience.